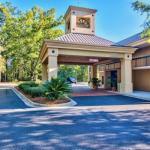 History and horse lovers enjoy free internet complimentary breakfast and an outdoor pool at Clarion Inn & Suites Aiken. Each of the 99 rooms at the two-story Clarion Inn features cable TV a coffeemaker hairdryer iron and ironing board. Some rooms also have mini-fridges and microwaves. You'll find complimentary Wi-Fi throughout the property so feel free to surf the net while enjoying the complimentary breakfast. Recreation comes in the form of an outdoor pool and exercise room. Copy and fax facilities are available as are meeting rooms. Your four-legged friends are welcome for a fee. Parking is free. The Clarion Inn is set in the heart of historic Aiken which means restaurants and shops are within walking distance. Hitchcock Woods Hopelands Gardens Palmetto Golf Course and the Triple Crown Race track are all within a mile radius. The Savannah River Nuclear Site is four miles away and the Aiken Polo Club five miles away. The hotel is 26 miles from Bush Field/Augusta Regional Airport and 52 miles from Columbia Metropolitan Airport.